Drug of choice for the treatment of bacterial vaginosis in the form of vaginal suppositories. An active ingredient is clindamycin, modern antibiotic that ensures fast and efficient treatment of bacterial vaginosis while maintaining maximum convenience of application. One suppository contains 100 mg of clindamycin phosphate equivalent to clindamycin. 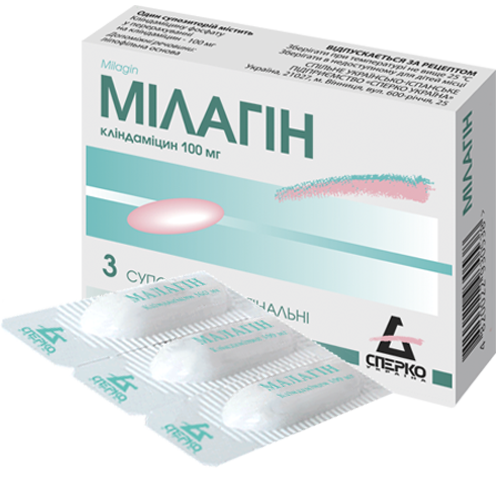 For detailed information on the medicinal product Milagin, please see “Package leaflet” page. Marketing authorization of MoH of Ukraine No.UA/5924/01/01 dated 19.10.2016.